This Columbus Day Weekend we are going to crack open the books and write a story that has never been written before. Covers with their corners bent from wear, pages that are filled with the colors of our lives buried under layers of life, each chapter filled with experiences that have and continue to shape our journey. Real connections between humans is what truly gives us the power and vitality to live fully and creatively. Disconnect and reconnect. Surround yourself with people who make your day bright. Pricing: Daily Workshop $165. Evening Workshop $65. Over 60 day and evening workshops to choose from. 50% discount for onsite parking. *Price is per full day workshop and includes lunch. There is a one off registration fee of $70 which covers all administration, venue and event management fees. ** Standard Hotel local and State taxes apply. Room rate ends 19th September. Oh those Sheraton beds … there is nothing like them. Then there are the delicious breakfasts (included) Starbucks Cafe, Bar, onsite parking, local restaurants just down the road and shuttle service to and from the train station. Guests can contact reservations toll free at 1-800-325-3535, request the Sheraton Stamford Hotel and the ‘Eat Cake Create’ group rate or Book online your room today. Your choice of traditional king or two doubles starts at $149 for up to two adults (includes buffet breakfast), or Club Level accommodations for $189 for two adults. In addition to the restaurant breakfast buffet, the Club accommodations include a Continental breakfast, daytime snacks/beverages, and an evening reception daily in the Club Lounge, and a room on one of our top two floors. Once an individual reservation has been made, any changes should be made directly with our Group Reservations Department. A credit card number or a 1 night advance deposit will be required to secure a room out of this block. Cancellations must be received 24 hours prior to arrival or 1 night room and tax will be assessed. 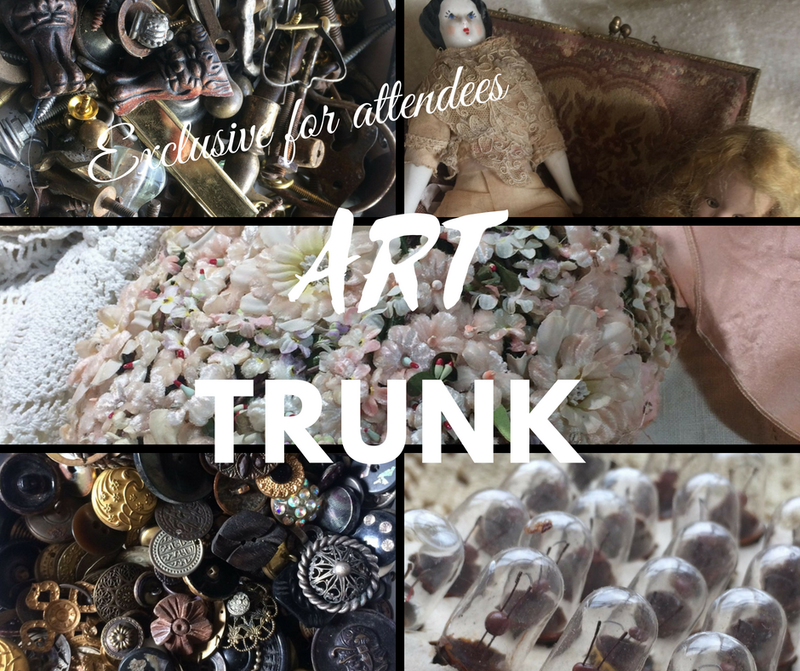 Vendors, you are invited to be a part of a boutique Art Trunk, exclusively for attendees. Quality vendors with vintage, flea market, ribbons, beads, charms, art supplies and more. Register for our exclusive Sunday Trunk – One table $150 and includes lunch. Cheri Moyer will be bringing her divine, eclectic collection of vintage and flea market finds and will be onsite all weekend for your shopping pleasure. We know that situations can sometimes arise causing a change to your plans. It is not possible for us to favor an individual situation or circumstance over another, so we must maintain a standard business policy for all and with no exceptions. It is understood that you have read and agree to our Policies / Waivers and Release Information.